If you have ever taken a basic economics course then you have probably heard of the fundamental law of supply and demand. Education systems around the world are learning this law first hand and are facing some very serious complications because of it. Why do I say this? Well, each year 8% of the United States' teachers leave teaching for good and, unfortunately, enrollment in teacher education programs is dropping fast year over year. In 2009 enrollment in teacher programs was at a solid 691,000 but in just three years that number dropped by 240,000 to 451,000 in 2014. The supply is just not able to keep up with demand. Analyst estimate that currently the U.S. is short approximately 60,000 teachers in the classroom and if these trends continue the annual teacher shortage could reach over 100,000 this year. Although, this situation could be ratified by improving things like teachers’ pay and enrollment costs, to drive more teachers back into the market, it is not always an effective solution for remote and low populated areas. These areas are notoriously difficult to find teachers to fill positions as the lifestyle choice and/or hardships associated with living in rural or unconnected regions can be major disincentives for professional teachers. Schools have begun to explore solutions in order to continue to provide efficient and effective learning experiences for students. One solution that is gaining more momentum in recent years is the digital classroom. The digital classroom implements some of the latest communication and engagement technologies to promote classroom learning, but it is also being considered a viable way to address the growing lack of teachers. Many of the features we commonly associate with this new style of classroom are being adapted to help bring more connection between teachers and students in different regions and schools. So What Features Are Helping to Meet the Demand of Schools for More Teachers? Unified communication and collaboration systems have made leaps and bounds over the past decade. They have become more affordable, feature high resolutions with wide FOVs, and many are integrated with low-bandwidth forward error correction technologies to provide connections on even some of the lowest bandwidth out there. With more availability to schools, video conferencing has become a major asset in helping fight the drought of teachers. Many schools are implementing programs for teachers to video call to teach a class remotely at a different school at least once every week. This creative solution allows regional schools to have access to high caliber teachers from across the country and world. These programs have become even more important with the rise of STEM and STEAM initiatives that aim to develop learning in more complicated fields. Having regular access to accomplished teaching experts in puts students on a better learning path to success and creates opportunities for students to grow and succeed where there might never have been one before. Software is playing a larger and larger role in the education sector. We are now able to integrate all school devices; including tablets, computers, and interactive flat panels (and hopefully AR soon), so that teachers, students, and administrators can remain connected. Software is giving teachers and administrators the ability to connect on the school grounds, but also the capability for teachers and admin to “push” information towards students while they are at home on sick leave or to students elsewhere simply over the internet. Other software programs help to strengthen a teacher’s online classroom management skills or provide organizational programs to help keep track of multiple classes and distant students so that they can prepare and effectively execute remote lessons easier and more confidently, making remote teaching much more effective and efficient. Remote tablet learning has changed the classroom. Teachers and students are able to instantly connect in class and feedback can be almost instantaneous, which brings an unbelievable level of engagement to the classroom. 1-on-1 teacher to student learning is an ever decreasing practice in an age where there are fewer and fewer teachers. With remote learning teachers are able to reach students faster and provide customized education plans for each student. With the push for global wi-fi it is now becoming possible for students in remote regions to have access to the same benefits that students have in the classroom. 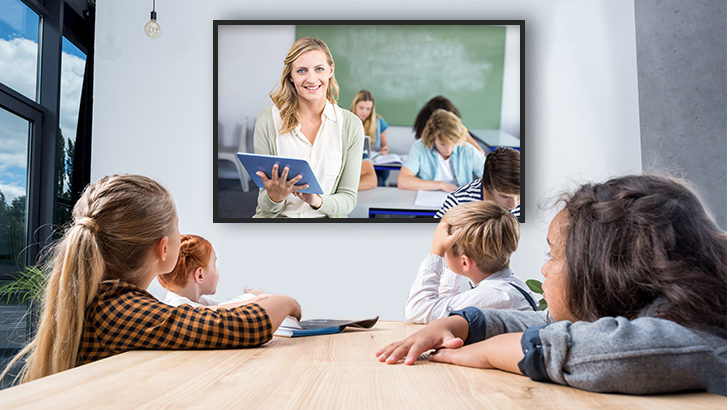 In combination with video conferencing teachers are able to reach out and engage with students from behind a screen, provide instant feedback, and answer their questions simply by clicking on their computer or tablet. With video learning, engagement has always been a difficult beast to tame. With the introduction of tablet learning into the equation, remote teachers now have the tools they need to keep students engaged even if they are on the couch at home or on the other side of the world. Three words… “Content Sharing Platforms”. With today's access to content sharing websites we are able to share information quicker and easier than ever before. This access has led to an explosion in online teaching courses available on everything from cooking to training your dog. Schools can leverage these platforms to provide lessons directly to distant students by simply uploading teaching lessons and classroom video so that anyone who is interested in learning or experiencing a lesson can. Free content sharing sites can even be more important for impoverished areas that stand no chance of joining or paying for high level experienced teachers to travel to their region. The idea of crowd sourcing subject material amongst teachers is a new concept, but could be one answer for schools struggling to find teachers across the world. The classroom is changing. Technology is helping to alleviate some of the problems that are raising their ugly head due to our mentioned supply and demand paradox from above. Finding the tools and techniques that can better improve student learning is of the utmost importance if we are to provide young learners with the education they so deserve and a future that is brighter than the past. A combination of communication and edtech might just be the right medicine for today. Find Out How AVer is Helping to Develop the Future Classrooms that Help Teachers and Students Connect. Matthew Hastings is the Global Marketing and Branding Strategist at AVer Information's Head Office in Taipei, Taiwan. Matthew works with our global teams to promote the AVer brand and help build unique strategies for AVer's full product lines of Unified Communication, Education, and Camera technologies.